This post marks the beginning of an Iroshizuku segment. I’ve got 8 samples and 2 bottles of Iroshi to get through. This ink is truly amazing. It is fantastic stuff. The colors on the whole are quite unique. As mentioned in the Iroshizuku Price Hike and Finding Affordable Substitutes post, this ink now has an MSRP of $35 (you can find it for $28 at JetPens). I personally refuse to spend that much on a bottle of ink, so I’m on the look out for suitable (and cheaper) alternatives. So, the format for these reviews is going to be a bit different. First, I’m going to review the Iroshi ink, then I’m going to show you an alternative to it if I’ve found one. Note2: The bottom and side portions are written using a Speedball B-5 1/2 dip pen nib. It writes just like a western broad nib. The paper is from a Rhodia N° 18 Blank pad. Thanks Lady D. I’m hoping it all works out. 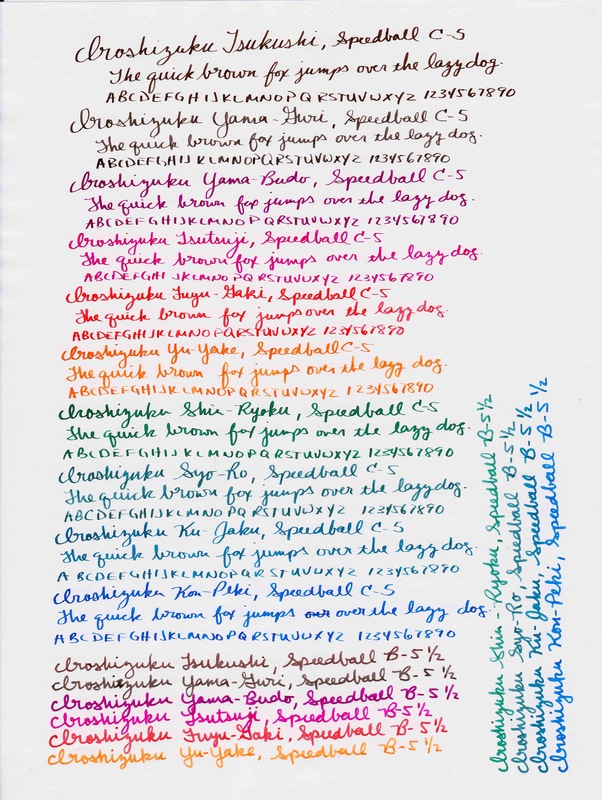 Finding Iroshizuku subs is not easy. These colors are just beautiful. I have about 9 bottles and I absolutely love them. Thanks so much for the samples. Seeing the colors this way makes them even better. i really love these inks, but they are just too expensive for me. I look forward to the substitute reviews! Which colors were you interested in?